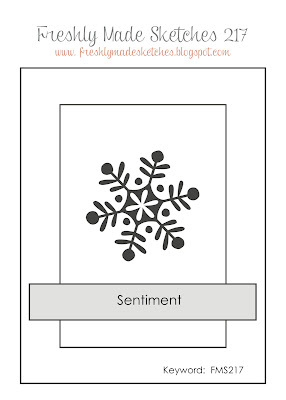 For my card, I went with a winter thanks theme. I stamped and colored the trees and the igloo from Have an Ice Day using Copics. I then used my Snow Marker pen to create some snow on the trees. I know the snow should be on the outer edges of the branches, but I thought this looked better :) I fussy-cut the trees and then created the "scene" on both the Gift Tag and the die-cut Zig-Zag Stitched Rectangle panel. I cut some snow-drifts and sponged them lightly with Tumbled Glass ink. I then sponged Tumbled Glass ink on the rectangle panel fading away as I got higher up the panel. Two snow drifts went onto the tag and the other onto the panel mimicking the sketch. The trees were then adhered to the tag and the igloo to the panel. 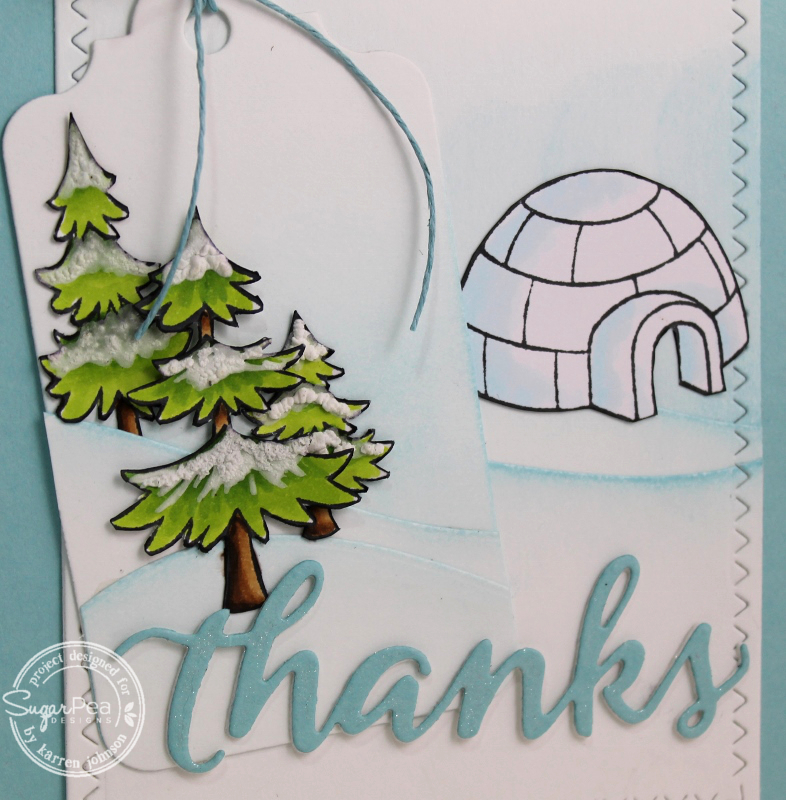 The beautiful, scripty "thanks" was die-cut and stacked three high and painted with Wink of Stella. Some matching twine for the tag and my card was done. 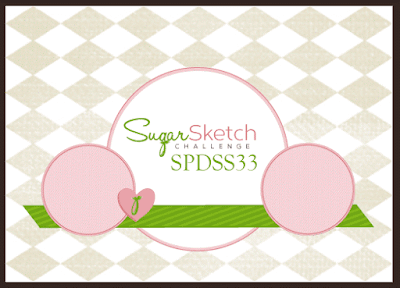 Upload to your blog or other Online Gallery using Keyword: SPDSS35 so that we may check out your beautiful work. Hi! Here's another card using one of my NBUS Girlfriends stamps from Art Impressions. After coloring them, I die-cut them with a circle die, cutting the front lady's foot out using the Out of the Box technique. I then put the layers together, using Papertrey Ink cardstock that most closely matched the Copic colors. 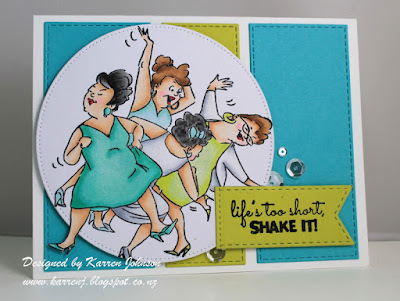 I used the sketch at Retro Sketches as well as the Sparkle theme at Simon Says Stamp. I bought several Art Impressions Girlfriends sets when they were on special a few months ago and finally getting around to coloring them. 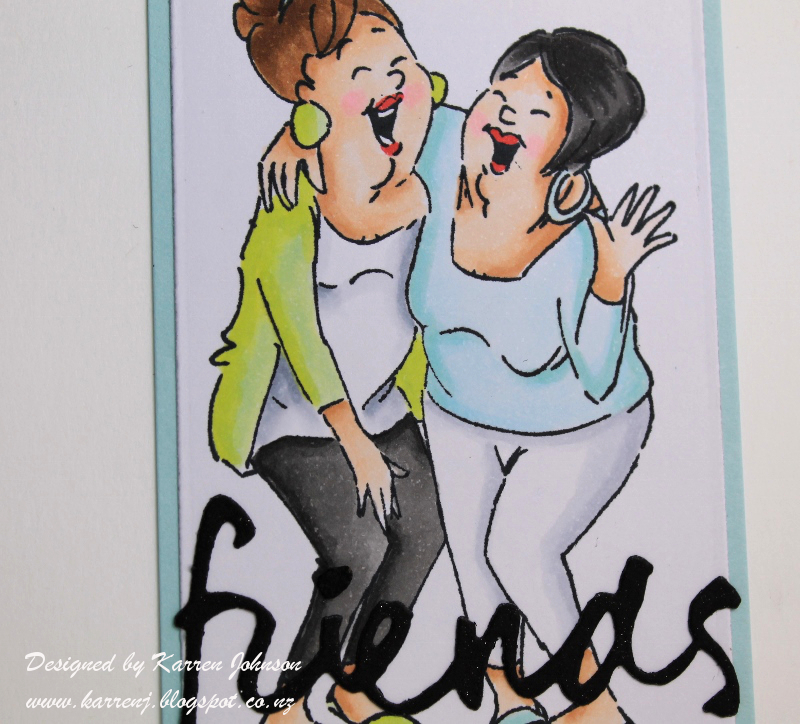 I have another card I'll put up later using another Girlfriends set. 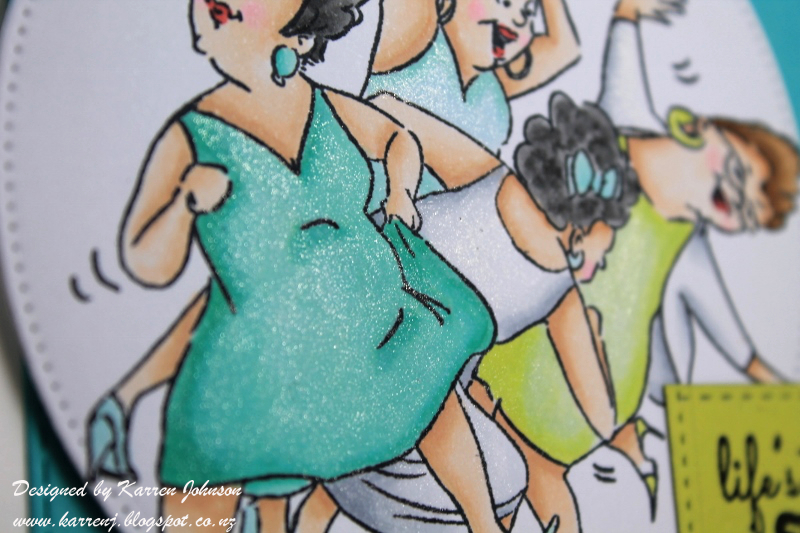 I used the Laughing set for this card and colored the ladies with Copics in pale blue and green. 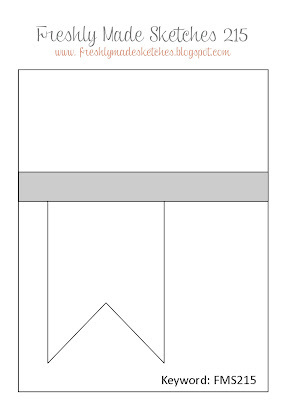 I then die-cut the image with Blueprints 6 before layering it onto a panel of Sea Glass cardstock. The word is die-cut with black card and colored with Wink of Stella. I used the sketch from Can You Case It for this card. Thanks for visiting. 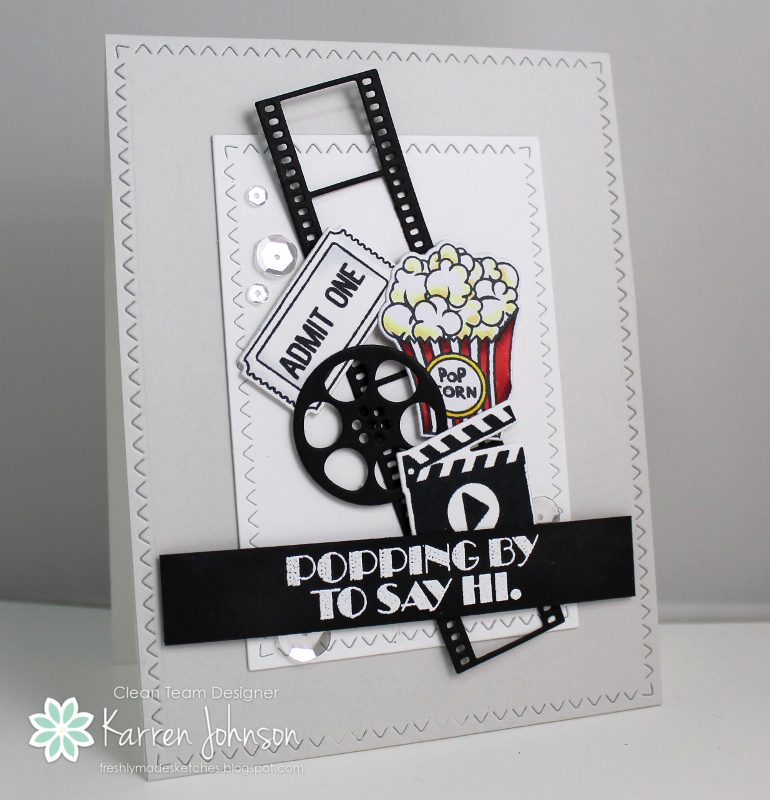 This uses the Wallflower set by CAS-ual Fridays. I stamped the two sizes of flowers and colored with Copics. I then fussy cut each flower and arranged them onto a white panel. The larger flowers are popped up on foam tape and the smaller flowers are stuck directly onto the panel. 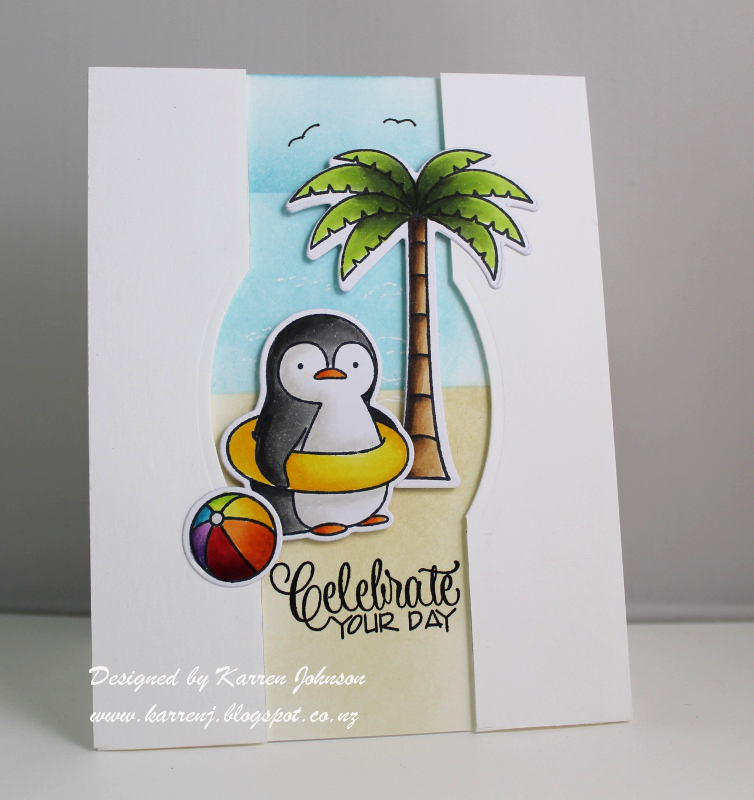 I layered the panel onto a piece of Hawaiian Shores cardstock and then onto a white card base. I finished the card with some PPP sequins. I'm linking this card to the current challenge at CAS(E) This Sketch. I'm not sure I've got the proportions of the sentiment right, but I hope you can see the general sketch. Hi and welcome! It's the day after Christmas Day (or Boxing Day as we call it) and I hope everyone had a wonderful Christmas! Our day was pretty low-key, spent with family. Today, I found some time to get back into the craft room and I struggled at bit at first. I've got nearly two weeks off work and there are so many techniques I want to try, that I didn't know where to start! In the end, I went with something I'd been wanting to try for months - a technique I saw on Sonja's blog. She developed a controlled watercolor technique which is so much fun and she also made a video. 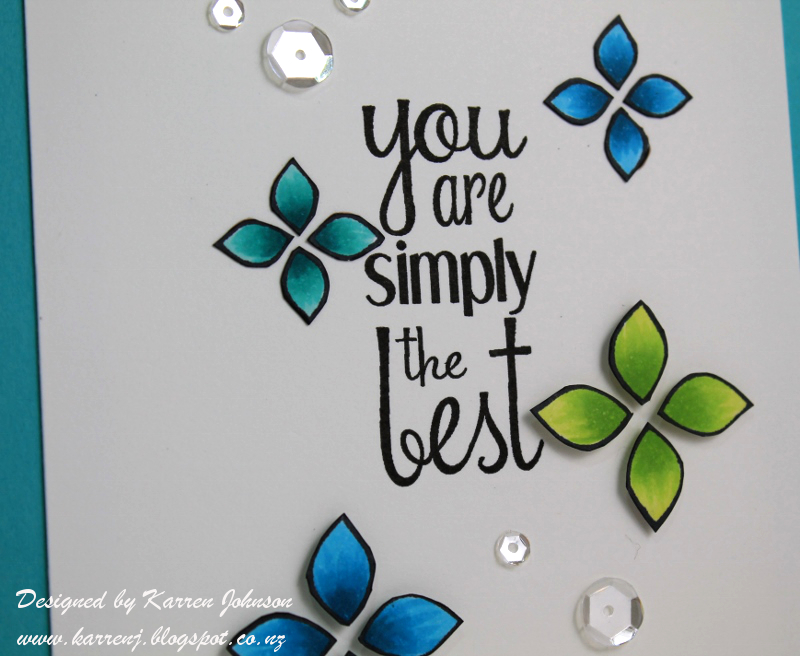 I started by white-embossing the Prism Lines background stamp onto some watercolor paper. Then I donned my disposable glove and started "painting" with Squeezed Lemonade, Twisted Citron and Spiced Marmalade inks. 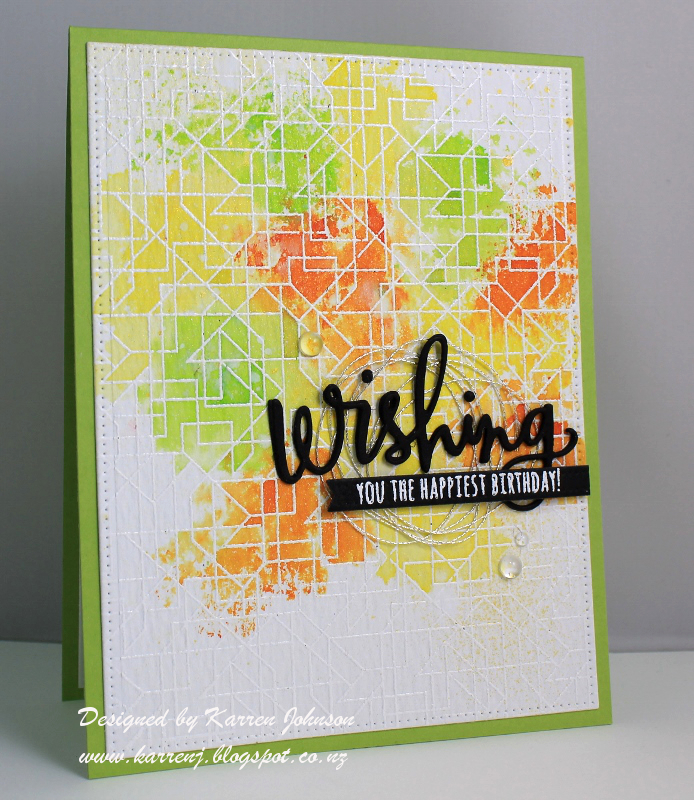 I was having so much fun that I made the colored piece a bit larger than I wanted :) I die-cut the piece with a pierced rectangle die and adhered it to a Green Apple card base. The sentiment was die-cut and stacked and the stamping was white embossed and cut with a pierced banner. I made a thread nest with some silver thread to place behind the sentiment and then finished it off with some PTI rain stones. 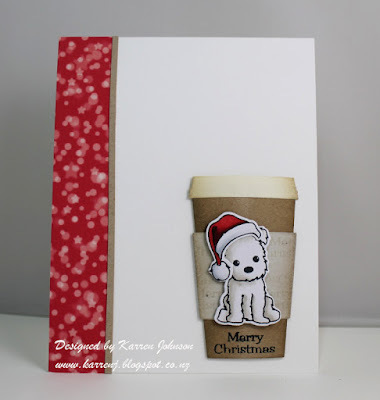 I have to say, it was nice to make a card that wasn't a Christmas card! 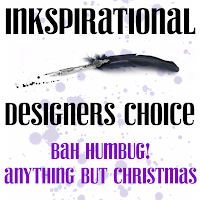 I'm entering this card into Seize the Birthday Anything Goes and Inkspirational's Anything but Christmas challenges. Hi! I thought I was done making Christmas cards, but I need a couple more and this is one of them. I have wanted this Paper Smooches stamp set since it first came out and it finally came to live with me :) I wanted to make a card straight away and made this one for the die-crazy challenge at Simon Says Stamp, the Christmas challenge at Color Throwdown and the Merry Christmas challenge at Sweet Stampin' Challenge. 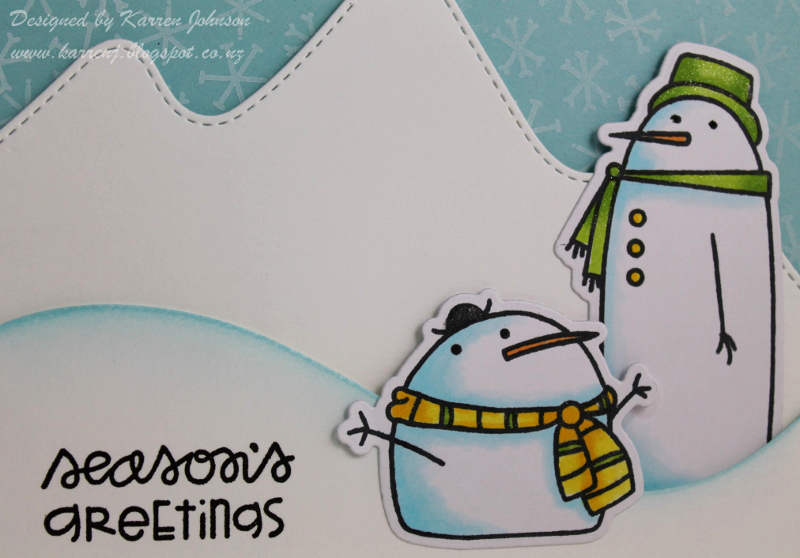 I stamped, colored and die-cut the snowdudes and then painted the colored parts with Wink of Stella. For the background, I die-cut a Surf Blue panel with Blueprints 15 and then stamped the snowflakes from the set with Unicorn White ink. 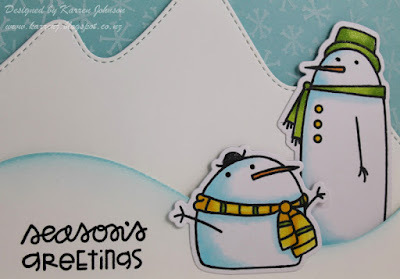 I then die-cut the Stitched Mountain Range and popped it up on foam tape over the Surf Blue panel.The tall and skinny snowman was adhered directly to the mountain range. The snowy curved panel was die-cut and popped up on foam tape after being lightly sponged with Tumbled Glass ink. The short and not-so-skinny snowman was glued to the curved panel and the top part had some foam tape to keep it steady. And that's it! Thanks for visiting. I actually made this coffee cup/dog combo last weekend, but couldn't get it looking good on a card. I put it to one side and now I'm now to the last six hours of the Coffee Lovers' Challenge, I just had to make it work somehow! I'm not in love with this card, but it'll do. 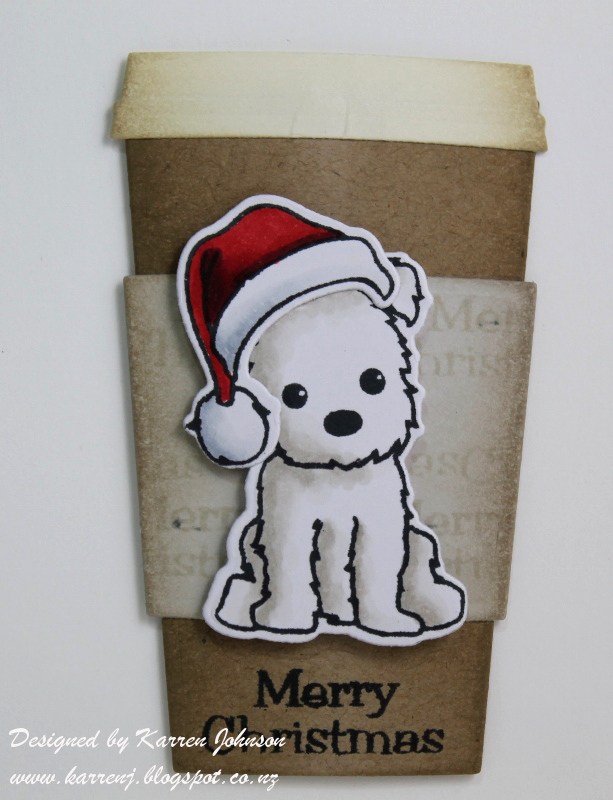 The wee dog, who looks a lot like our wee toy dog, was stamped, colored and die-cut. The coffee cup is a MFT die and I sponged the edges to give some dimension. I also stamped the "Merry Christmas" sentiment across the band using Soft Stone ink for a tone-on-tone look. And that's pretty much it. Thanks for visiting! 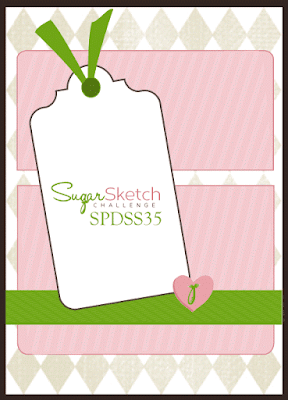 Hi and welcome to a new sketch at SugarPea Designs Challenge! 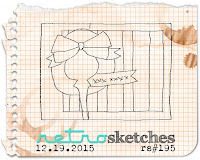 This week, we have a classic sketch which allows for such a lot of creativity. 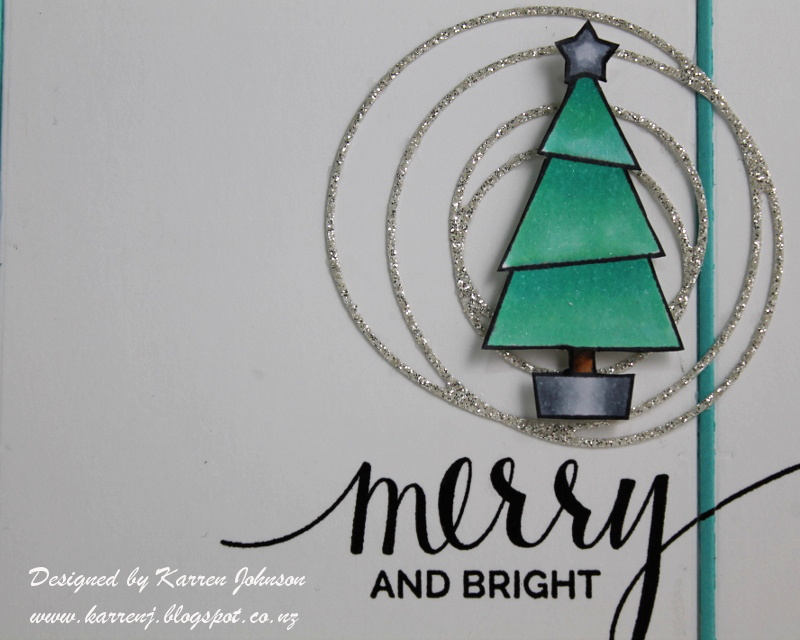 For my card, I went with a Christmas card in turquoise, lime and silver, using the set Funky Wreath - Christmas and Have an Ice Day for the sentiment. 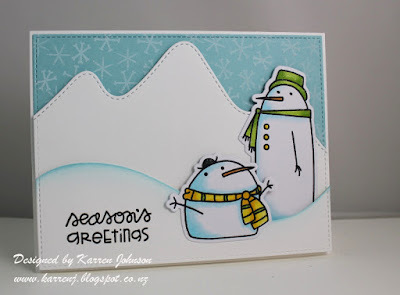 I started with a white card base and onto that I layered another white panel with rounded corners. Some Audrey Blue cardstock at the top and a silver foil scalloped piece formed the bones of my card. 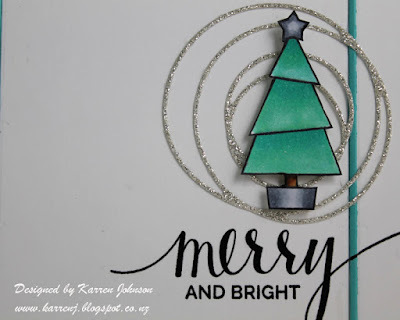 To pretty it up, I got to stamping :) I used the beautiful Funky Wreath Christmas set and after die-cutting the frame, I stamped one of the images several times in Audrey Blue, Green Apple and silver inks, shifting the stamp slightly each time. 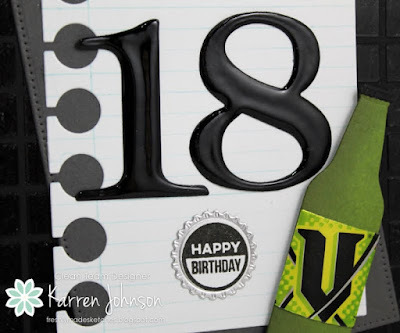 I then stamped the bow in silver ink and white embossed the sentiment onto the banner from the Gift Tag Die set. Here's a close up of the beautiful images in the wreath set. Thanks for visiting. 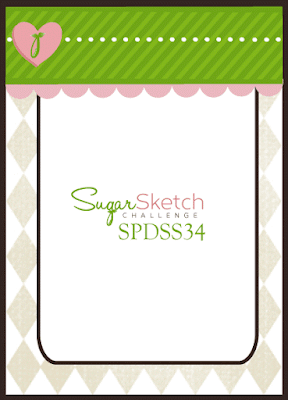 Be sure to check out the rest of the design team as they have made some wonderful cards with this sketch. Karren Johnson - you are here! Hi! This is the first card I've made for fun in two weeks :( But I finally got some time to myself in the craft room and after I'd made my cards for DT commitments for the week, I got to play. And I made a card for a few challenges out there: CAS(E) This Sketch, Just Add Ink, CASology and Virginia's View. I started with a white card base and out of that I die-cut the Frames die and then inlaid the thin frame which I'd cut from Audrey Blue cardstock. Unfortunately, that plan went out the window when I accidentally ripped the blue frame - after it was stuck down in parts! So I had to lay another frame over the top and it worked - thank goodness. The tree was stamped and colored with aqua colored Copic markers and I tried for a silver-colored base and star using Copics. It was then coated in clear Wink of Stella. Thanks for visiting. 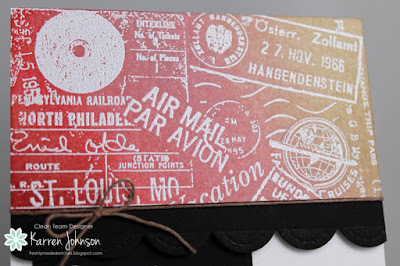 I'm hoping to get some more time to stamp tomorrow! Edited to Add: This card got a shout out at Just Add Ink, CAS(E) This Sketch and CASology. Hi! 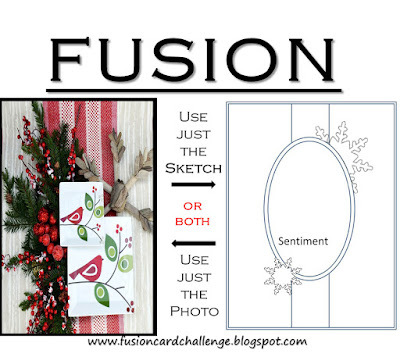 It's Fusion Card Challenge time and we have a fabulous sketch and inspiration photo for this, our last challenge of the year. 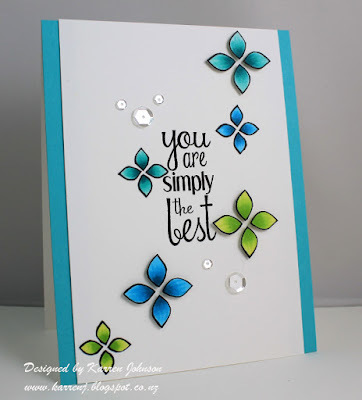 On a white card base I sponged some sand and sea using Old Paper, Tumbled Glass and Broken China distress inks. I used a white gel pen for the waves. I stamped and colored the penguin, tree and ball before die-cutting them. 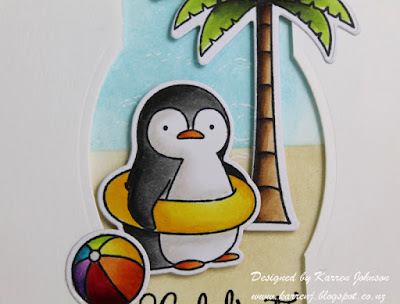 I then used an oval die to partially die cut the top layer of white cardstock. 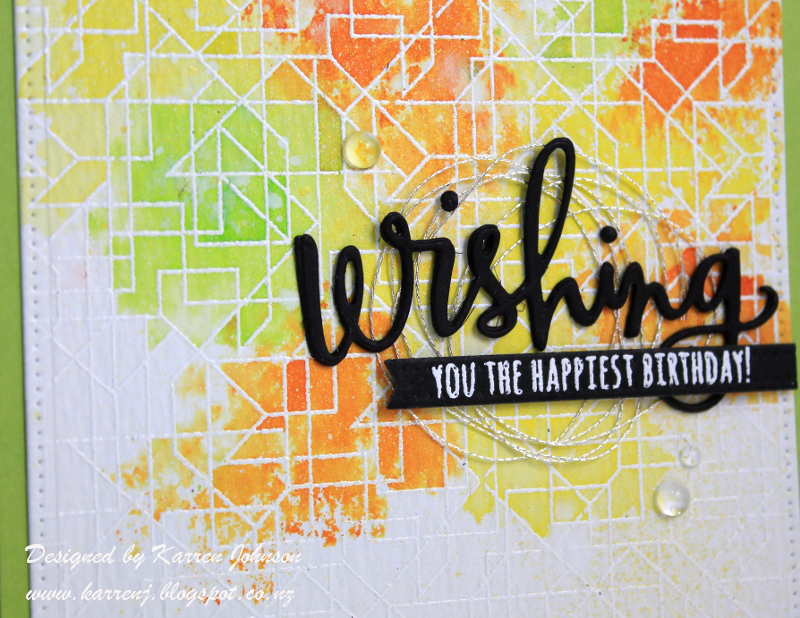 I then positioned the colored elements onto the card before stamping the sentiment. I used a Copic Multiliner pen to draw the seagulls - that is the extent of my drawing skills :) And that's it! In hindsight I wish I hadn't used a white top layer but it's too late now! Thanks for visiting. The rest of the design team have used the challenge graphic to make some spectacular cards, so be sure to check them out. 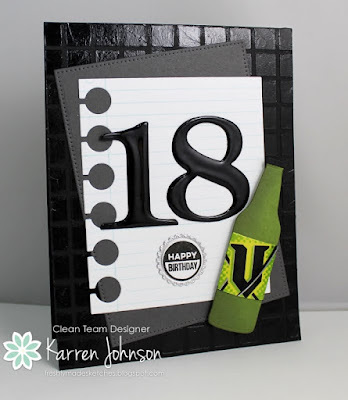 Speaking of drinking, much to my dismay, my son is pretty much addicted to the energy drink "V" hence the bottle on his card. I die cut the bottle and sponged it with Green Leaf and Olive inks to try and mimic the color of the real bottle. I then peeled off the label from a real bottle and die-cut the logo to adhere to my cardstock bottle. The card base was stenciled with translucent embossing paste and a grid stencil. While that was drying, I also coated the "18" with Glossy Accents and left it to dry. The "notebook" panel was stamped with the Notebook Paper Background in Surf Blue ink then die-cut with Paper Smooches Paper die. 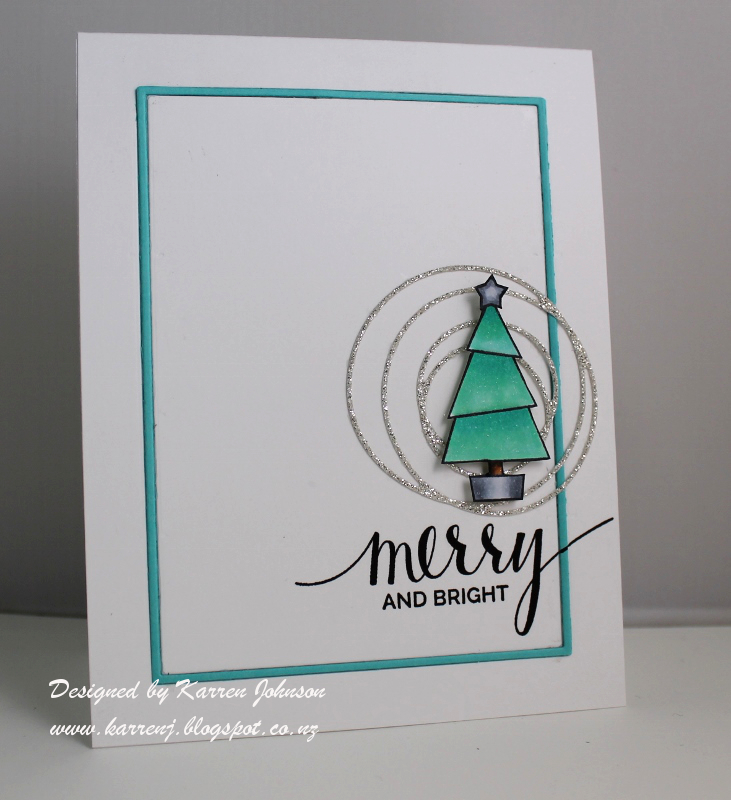 The bottle top was die-cut from silver foil cardstock. And that's it. I hope he likes it - not that he'd ever admit it, of course - he is a teenager! Be sure to check out the gorgeous cards produced by the rest of the design team. They're sure to inspire you as always. 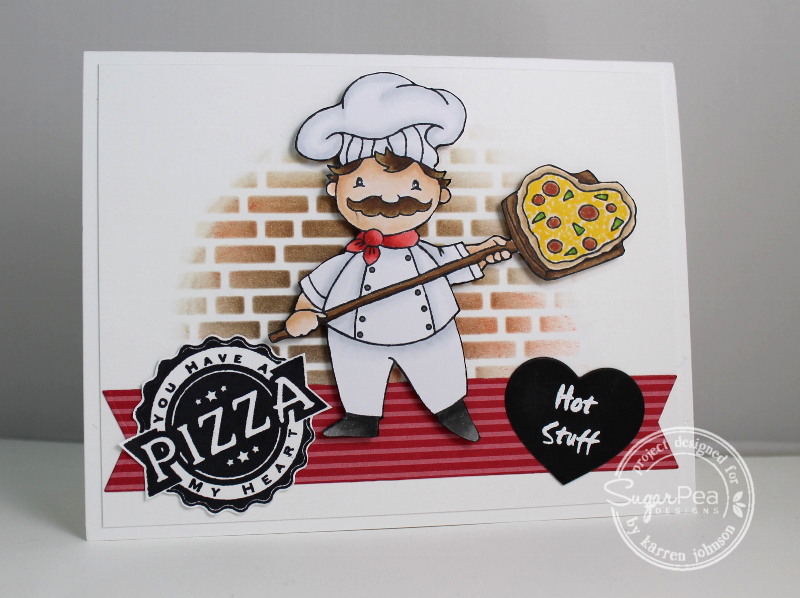 I stamped and colored Pizza Guy from Pizza My Heart and put him to one side while I worked on the rest of the card. I laid a brick stencil onto the card base and sponged several colors of ink in a circular pattern, fading out at the edges. I then cut a double-ended banner shape from some old patterned paper. 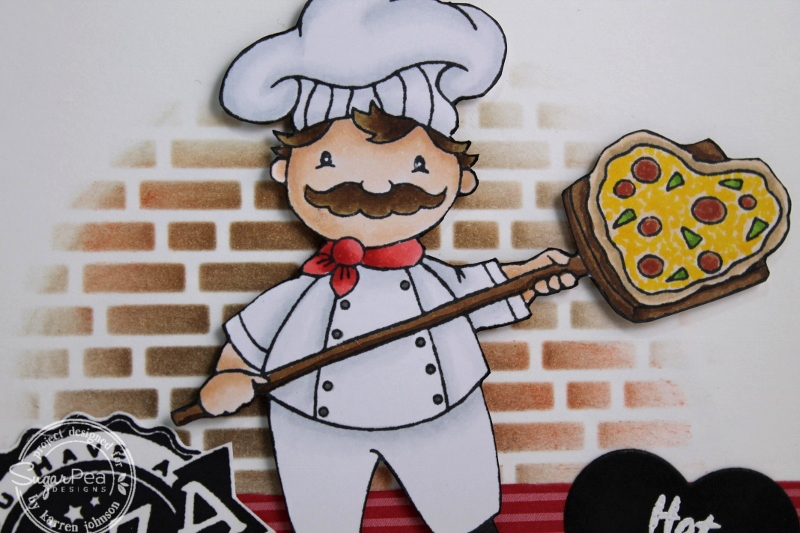 The pizza image on the left was stamped and fussy-cut and the heart on the right was punched out. I took one of the sentiment stamps in the set and cut it up to fit inside the heart. Thanks for visiting! Be sure to visit the rest of the team by clicking on their names below. They each have a wonderful card showcasing this sketch. I hope you'll have time to join us - you have all month to play along but we will be providing a new sketch each week. 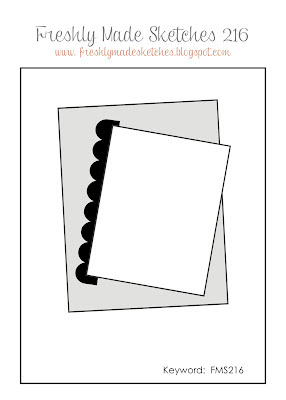 You can make a card for each sketch or just play once or twice - it's up to you. 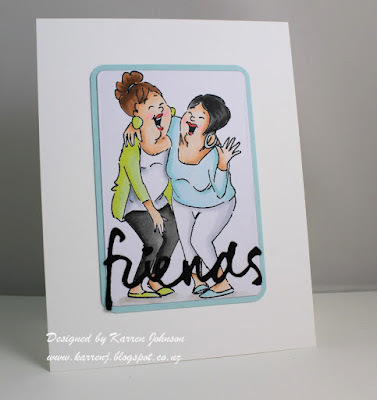 It's Freshly Made Sketch Challenge Day and this week our hostess is none other than the very-talented Jen Mitchell who always amazes me with her fabulous cards. Jen's sketch is so cool - I loved it as soon as I saw it! Unfortunately, while I may have loved the sketch, my mojo wasn't present when I was trying to make my card! 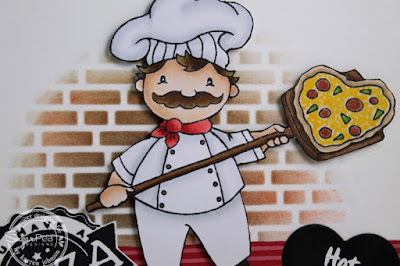 I wanted to do an emboss resist on the top part of the card so dug around in my stamps for a suitable image. I found an old, old wood mount stamp from a company called Just for Fun and decided to use that. I white embossed that onto a panel of watercolor paper and sponged on Antique Linen, Tattered Rose, Victorian Velvet, Barn Door and Fired Brick ink from right to left across the panel. I saw this color combo on Pinterest and thought it looked gorgeous! Once the panel was finished, I cut it down to size and mounted it onto a black stitched scallop piece. 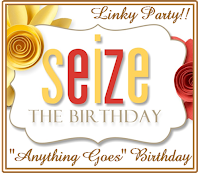 The banner was white embossed and glued to the card base and the top panel and scalloped piece is mounted on foam tape. I tied some kraft colored twine around the panel to bring in the Antique Linen ink a bit more. Thanks for visiting! Be sure to check out the wonderful creations from the rest of the design team.